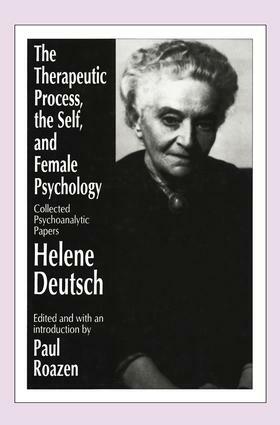 Helene Deutsch was one of the most famous psychoanalysts to emerge from Freud's immediate circle in Vienna. Best known for her writings on female psychology, she was also one of the great teachers of psychoanalysis. As the founding president of the Vienna Psychoanalytic Training Institute, she confirmed her stature in the history of psychoanalysis by cultivating a whole younger generation of influential analysts. Deutsch was tolerant and open-minded, both as a theoretician and teacher, but, as Paul Roazen remarks in his introduction, independence and an absence of fanaticism can mean a temporary fading out of influence. For the first time, Deutsch's major professional contributions are brought together for permanent consideration. This volume documents her enduringly valuable exploration of the complexities of the psychology of women's experience. Deutsch remained essentially faithful to the Freudian canon. Nonetheless, and throughout these writings, she developed ideas on the subject of femininity that were often at odds with those of her mentor. Her use of Freud's theories aimed to encourage toleration of human diversity and to modify his model of sexuality according to the particular circumstances of women's lives. It was Deutsch who introduced motherhood as a central concern of psychoanalysis by stressing how the psychological dimension of reproduction was different for men and women and how this uniquely feminine capacity had its effects on the entire psychology of women. The same commitment to human diversity informs her much-misunderstood work on the clinical problems of female sexual dysfunction. While accepting the Freudian goal of sexual gratification, Deutsch argues that sublimation through work was a key value in its own right This is illustrated in "George Sand: A Woman's Destiny," a brilliant early example of psychobiography. This volume of Deutsch's classic papers, several appearing in English for the first time, will be of interest to psychologists, intellectual historians, and women's studies specialists. Part One Female Psychology, Part Two Psychiatry, Part Three Neurosis, Part Four On Identification, P art Five Therapy, Epilogue.